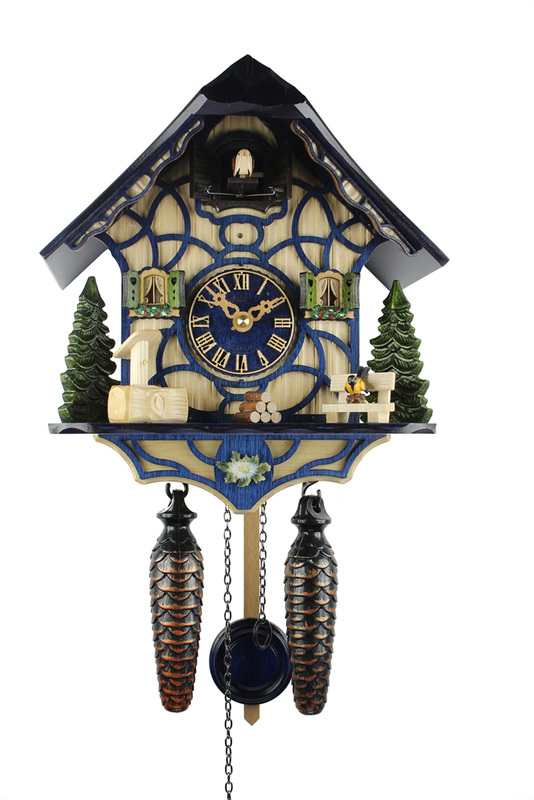 A cuckoo clock with a typical Black Forest half-timbered house in a blue colour. It has a hand carved roof, fir trees and a water trough. The cuckoo calls on the hour and is followed by an echo and by one of 12 alternating melodies. A light sensor automatically turns off the cuckoo sound and the music at night, or they can be turned off anytime by means of a manual switch. The clock is personally signed at the back by the manufacturer Adolf Herr. His signature guarantees the experience of 6 generations of clock-workmanship. This clock comes with a certificate of authenticity (AHC).